Posted June 17th, 2016 by Ana & filed under Uncategorised. I have exciting news for you: The Texas Digital Newspaper Program Blog is moving to a new location, in the “News” section of The Portal to Texas History. We will continue to offer regular posts about treasures we find in the newspapers and on the Portal, and we hope you keep reading! Posted May 2nd, 2016 by Ana & filed under General. As of today, May 2nd, we celebrate 4 million pages preserved in the Texas Digital Newspaper Program, and we have some tidbits for you to help us celebrate! The Texas Digital Newspaper Program would not exist without the generous support of many contributors, including those groups who provide newspaper content for inclusion and those who provide funding to add more newspapers every day. These groups include the National Endowment for the Humanities, who selected UNT Libraries as the National Digital Newspaper Program institution for Texas, for three contiguous cycles, and through which over 300,000 pages of historic Texas newspapers have been digitized in Chronicling America and included in the TDNP collection. This also includes the Texas State Library and Archives Commission, who have been long-time supporters of TDNP through grant programs like TexTreasures. From private foundations, the Ladd and Katherine Hancher Foundation have awarded newspaper digitization funding to libraries in communities with populations over 50,000, and as a result, have enabled such libraries as the Ellis Memorial Library and the Zula B. Wylie Library to add their newspapers to TDNP. And one very special milestone also occurred today for the Tocker Foundation Grant Collection, which is that it has now reached over one million pages of newspapers digitized. The Tocker Foundation supports digitization of newspapers for community libraries supporting populations below 12,000, with a commitment to create worldwide access to rural Texas history, and their contributions represent a full quarter of the newspaper content available in the TDNP collection. To learn more about the Tocker Foundation digitization grants, you can visit their website. The Tocker Foundation’s generosity has supported rural public libraries in many endeavors, and our heartfelt appreciation and congratulations go out to them. Multiple significant collaboration projects that have helped to grow this program have been with the Dolph Briscoe Center for American History, who has partnered with us in many TexTreasures grants as well as in the National Digital Newspaper Program. Another very important partnership has been with the Abilene Library Consortium, with whom we have partnered on many projects to make local history freely available and digitally preserved. The most recent collaborative project has been with the Texas Press Association, in a noteworthy collaboration with NewzGroup, to preserve PDF newspapers created by TPA member publishers. This body of newspaper content represents 457 paid-circulation newspapers. In the cases of newspapers that have been scanned from microfilm or physical page, the PDF content caps an entire newspaper run, up to a date specified by the publisher. The Texas Digital Newspaper Program is the largest, freely-accessible repository of newspapers in Texas, and it is among the largest in the U.S. As such, this collection represents a significant hub of research for UNT faculty and students. In 2015, in furtherance of its commitment to digital preservation, UNT Libraries completed a self-audit of their digital repository policies, documentation, and infrastructure in accordance with the Trustworthy Repositories Audit & Certification: Criteria and Checklist (TRAC). The news content, including both digital newspaper and news video content, represents the largest single collection in the UNT Libraries’ Digital Collections. Full documentation and appendices are available here. One additional milestone has also happened this month. The Portal to Texas History has released a beta design of the Portal that we hope you’ll visit. If you see a red “Feedback” flag appear in the bottom, right-hand corner of the screen as you’re perusing the beta, please don’t hesitate to click on it and tell us what you think about the beta design. We also have a newspaper scavenger hunt for you. This hunt comes from all of the Digital Newspaper Unit staff. We look at newspapers all day, every day, and we really enjoy finding new bits of trivia and new people to talk about in the TDNP blog. We hope you find these puzzles as much fun to solve as we had putting them together. Come back next month for the answers! 1) This famous musician hails from Lubbock, and according to one newspaper, kept an opossum as a pet when he was a child. Who is the musician, and what newspaper talks about this? 2) What community is the home town of Big Tex? 3) In 1946, future Archer City celebrity Larry McMurtry lost his dog. How old was he when he lost his dog, and what kind of dog was it? 4) What is Katherine Stinson famous for, and in what newspaper issue can we read about her? 5) What city reported on a giant sea monster being turned over to Dr. Agustin Cabrera Diaz for research, and when? 6) What is the oldest Texas newspaper on the Portal, and what is its date? 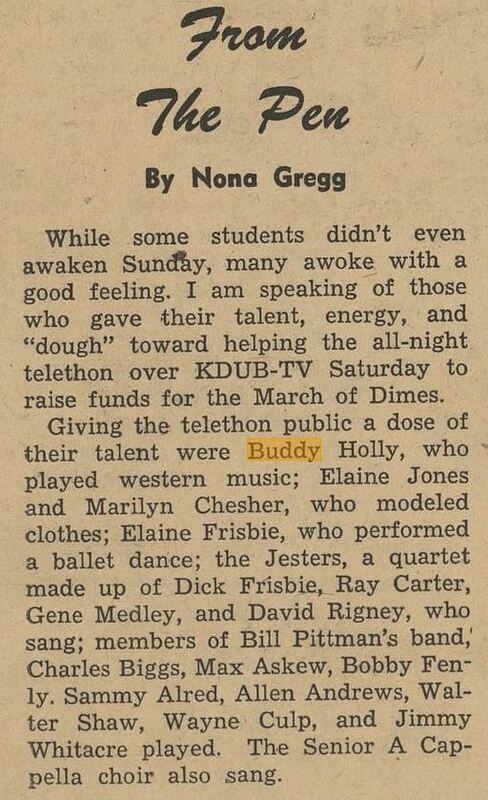 7) What are the titles of the student newspaper published for what is now University of North Texas? 8) Who is Floto? 9) This easternmost Texas county documented its courthouse restoration in its newspapers. Which county is it, and in what years did the restoration take place? 10) This newspaper from March 24, 1836, documents what incredibly important event in Texas history? Finally, thanks to all of the Digital Newspaper Unit staff and student assistants who have made this possible. Posted April 1st, 2016 by Ana & filed under Uncategorised. With this blog post, we are beginning a new series of biographies of famous Texans, before they were famous, in which we research the lives of Texans in their hometown newspapers. Currently, TDNP hosts so many newspaper title runs that we are very excited to learn what we can about our now-famous Texans. For the first post, we have a guest writer, one of the Digital Newspaper Unit’s student assistants, Patrick Alonzo, who normally works on scanning the full-color newspapers you can find in the Texas Digital Newspaper Program. Patrick grew up in Lubbock, Texas, and he actually scanned many of the issues of the Westerner World that he mentions in the post below. Texas State Historical Association. The Texas Historian, Volume 49, Number 1, September 1988. Austin, Texas. The Portal to Texas History. Accessed April 1, 2016. Don McLean sang about the day the music died, and on that fateful February day, Lubbock lost its favorite son. 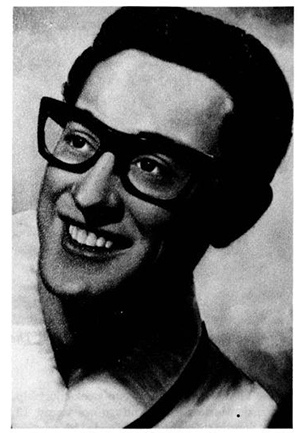 On that day, a rising star in the world of music, though burning brightly, burned out much too early. 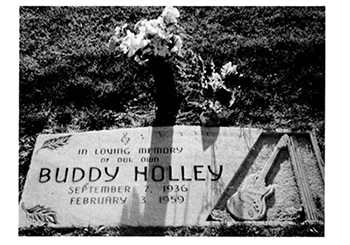 However, although the music may have died, we must always remember that it was indeed real, and at one time, you could find it in a small, cotton-farming city in West Texas where many nights you can hear little more than the wind howling across the plains. 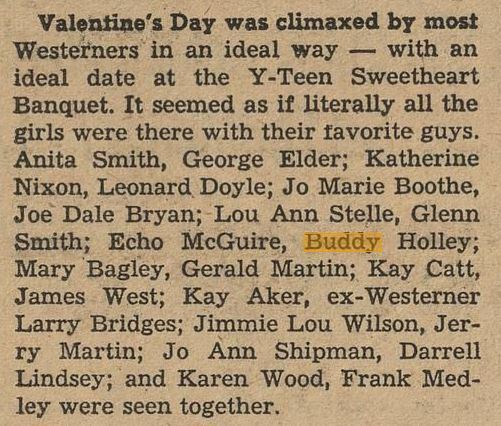 But if you were fortunate enough in 1953 to be in a certain high school auditorium on a certain day in March, you’d hear something else. You’d hear the voice of a young man with a guitar in his hand and a smile on his face, and you’d know, just for that moment, the music surely was alive. Posted November 2nd, 2015 by Ana & filed under General. Extra! Extra! 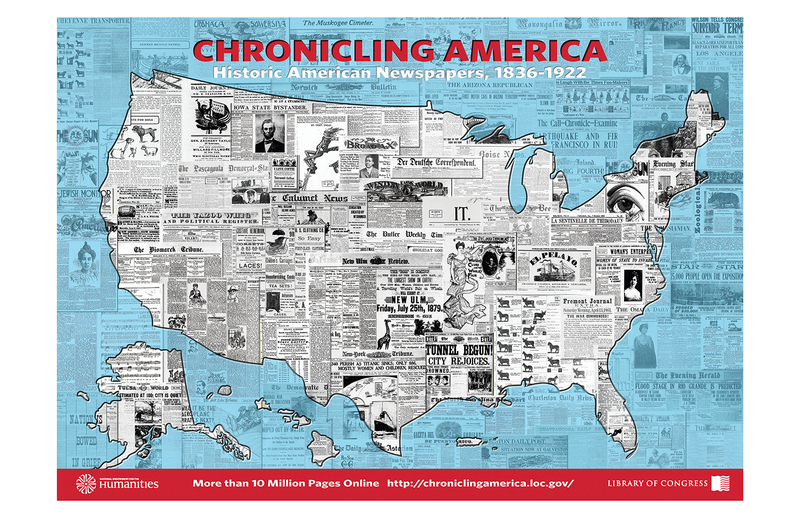 Chronicling America Reaches 10 Million Pages! Posted October 14th, 2015 by Ana & filed under Uncategorised. Congratulations to New Partner Libraries! Posted October 7th, 2015 by Ana & filed under Uncategorised. In Fall 2015 multiple new partner institutions have received digitization grants to preserve their area newspapers by making them available in the Texas Digital Newspaper Program. We are very excited for these libraries, and we look forward to digitizing and uploading their newspapers. Here is a sneak peek so you can keep your eyes peeled for new research vistas in the near future. Silsbee Public Library: Received a Tocker Foundation grant to digitize its Silsbee Bee. Wharton County Library: Received a Tocker Foundation grant to digitize Wharton County area newspapers, representing the communities of El Campo and Wharton. Nellie Pederson Library: Received a Tocker Foundation grant to digitize the Clifton Record and Clifton Enterprise, in collaboration with the Cleng Peerson Research Genealogy Library. Jackson County Memorial Library: Received a Tocker Foundation grant to digitize Edna and Jackson County area newspapers. Ennis Public Library: Received a Hancher Foundation grant to digitize the Ennis area newspapers, including the Ennis News. Burleson Public Library: Received a Hancher Foundation grant to digitize south Tarrant County area newspapers, representing the communities of Burleson, Alvarado, Keene, and Everman. Taylor Public Library: Received a Hancher Foundation grant to digitize selected years of its community and county newspapers. The Tarrant County Archives: Received a Rescuing Texas History 2015 Newspaper grant to digitize selected newspapers from the early years of Tarrant County. Texas Lutheran University: Received a Rescuing Texas History 2015 Newspaper grant to digitize selected years of its student newspaper, Lone Star Lutheran. Crockett County Public Library: Received a Rescuing Texas History 2015 Newspaper grant to digitize selected years of its area newspaper collection. San Jacinto Community College-South Campus Library: Received a Rescuing Texas History 2015 Newspaper grant to digitize selected years of the South Belt/Ellington Leader newspapers. The Humble Museum: Received a Rescuing Texas History 2015 Newspaper grant to digitize selected years of the Humble Echo. St. Mary’s University Library: Received a Rescuing Texas History 2015 Newspaper grant to digitize selected years of its student newspaper, The Rattler. Mesquite Public Library: Received a Rescuing Texas History 2015 Newspaper grant to digitize selected years of the Texas Mesquiter. Texas State University: Received a Rescuing Texas History 2015 Newspaper grant to digitize selected years of its student newspaper, The College Star. Friench Simpson Memorial Library: Received a Rescuing Texas History 2015 Newspaper grant to digitize selected years of The Hallettsville Herald and The New Era. Lamar University Mary & John Gray Library: Received a Rescuing Texas History 2015 Newspaper grant to digitize The Pine Needle. McKinney Public Library: Received a Rescuing Texas History 2015 Newspaper grant to digitize selected years of the McKinney Courier-Gazette. The dedication of the groups who have applied for and received these grants shows the importance of newspaper preservation and access to Texas communities. The preservation infrastructure of The Portal to Texas History ensures that partners’ newspapers will be available for research for generations to come. Texas communities are spread across a huge geographical area and are situated in climates that can cause severe deterioration to newspaper pages, making standards-based digital preservation a critical necessity. We congratulate all of our new partner institutions, and we would like to thank the publishers who have worked with these libraries on making their newspapers accessible for researchers worldwide. Finally, we would like to give our special thanks to the Tocker Foundation and the Ladd and Katherine Hancher Foundation, who have made access to these rich newspaper histories possible. Posted August 25th, 2015 by Timothy & filed under Uncategorised. 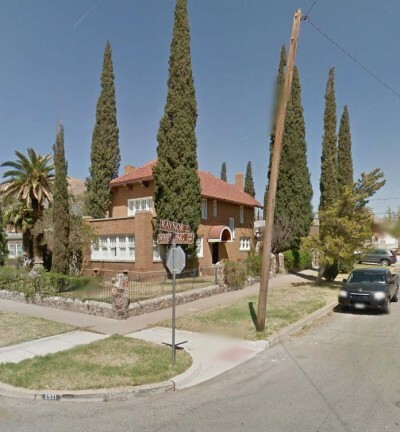 Tim Gieringer just can’t stop himself from historical tourism, and I caught him looking at El Paso, Borger, and Dallas this month. He offered to write the August post, and when I saw what he came up with, I thought everyone would enjoy it. Happy August, everyone! We look at lots of newspaper pages here at the Texas Digital Newspaper Program. Lots. In the course of our work, we can’t help ourselves from stopping to read some of the articles or to admire the old advertisements and graphics. Often, when reading a story about a particular person or event, I’m driven to investigate further to find out how the story ends. And as someone with an affinity for old buildings (see previous post), I’m often finding myself doing some “Google Tripping” to find out the fate of these buildings I see in the newspapers. 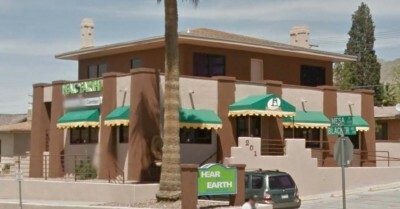 Google Tripping for me is simply the act of looking up a location on Google Maps Street View to see what it looks like today. Newspapers of the past are filled with announcements of new constructions, advertisements for real estate, event listings, etc., that offer a glimpse into the history of our built environment. As you will see in this post, there are some happy endings, some hopeful stories, and inevitably some losses. First up, we take a trip to El Paso. 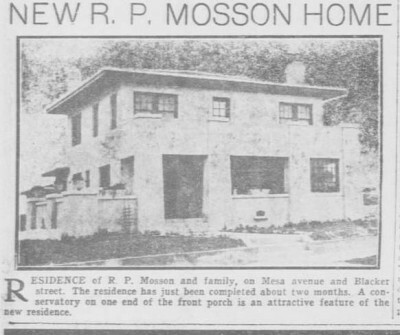 While working on the metadata for our El Paso Times and El Paso Herald newspaper collections, I quickly realized that there was a goldmine of real estate advertisements in these papers, many of which included photographs and detailed information. 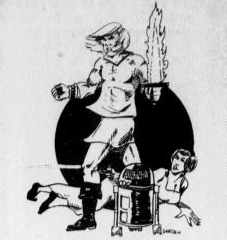 I got caught up in one issue in particular, from August 25, 1917, of the El Paso Herald. In fact, I was so enmeshed, I had to stop myself from making this entire post about the buildings found in this issue. From El Paso, I was finally able to select two buildings for this post. The amount of attention devoted to these homes shows that they were clearly significant structures at the time. First up is a home that is still going strong with beautiful landscaping and even some classy topiary, seen below. 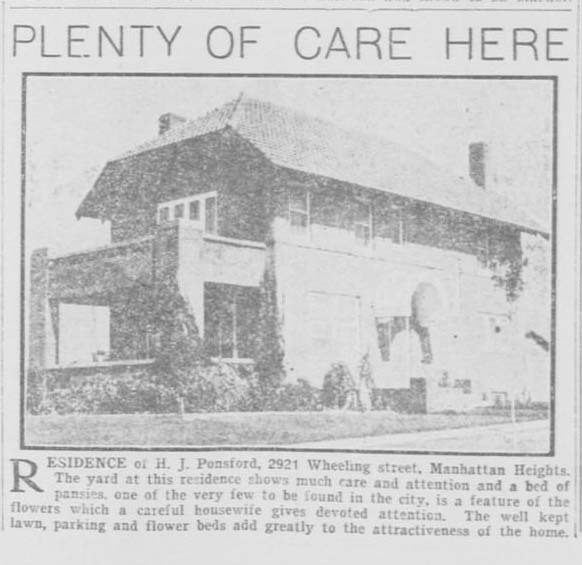 The former residence of H. J. Ponsford on Wheeling Street, seen in the picture above left, was noted in the 1917 issue for its well maintained landscaping. 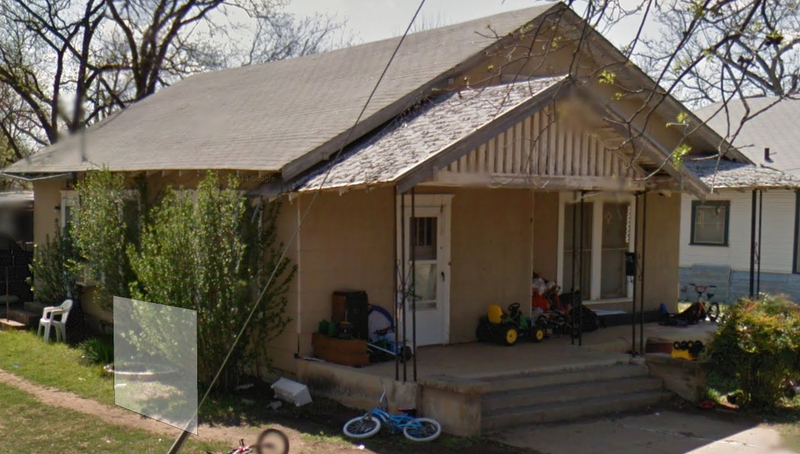 As you can see in the above right picture, almost 100 years later, the house looks virtually the same. Now for something that has changed roles a bit, we look at the former R. P. Mosson home located at Mesa Avenue and Blacker Street. At first glance, a passerby may not associate the former single-family home on the left with the business location below, but a closer look reveals that the roof-line matches and that it even retains its two original chimneys. The side porch and the front porch with a conservatory have been altered, but their outline is still recognizable. I’ve quickly learned that a paper with extensive real estate advertising makes it easy to get carried away Google Tripping. But sometimes you come across things serendipitously that need to be looked into. 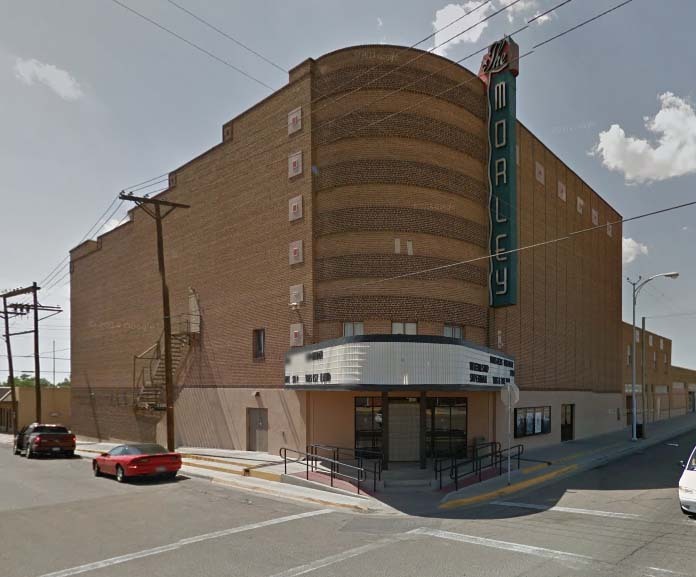 While looking for a different building (that no longer exists) while Google Tripping in Borger, Texas I stumbled on a huge theater that piqued my interest. 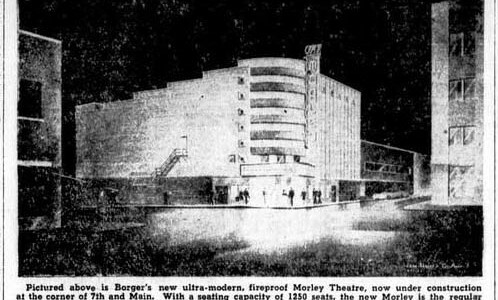 A quick search through the Borger Daily Herald resulted in this advertisement for a new fireproof theater opening in Borger. Amazingly, The Morley Theatre (seen left) is still showing movies today! I wonder if they still have the “ladies’ cry room” or “smoker?” While these articles made the Google Tripping easy by providing addresses or cross streets, occasionally some digging is required to find the current location. 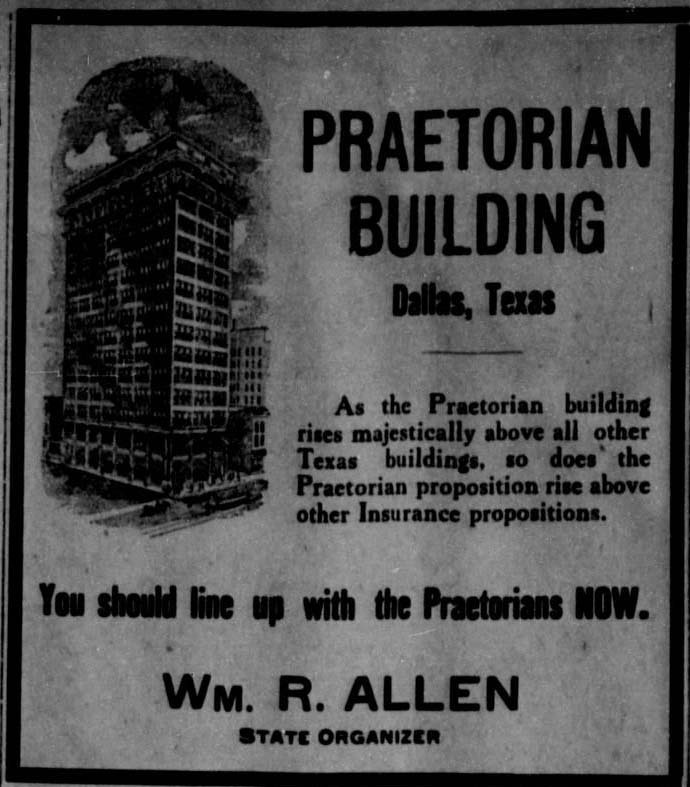 Recently, I also learned about The Praetorian Building, the first skyscraper, not just in Dallas, but in the entire Southwestern United States. There are many mentions of this famous building on The Portal to Texas History, including these advertisements. Reading about the history of the building was rather sad and too complicated to dive into here. 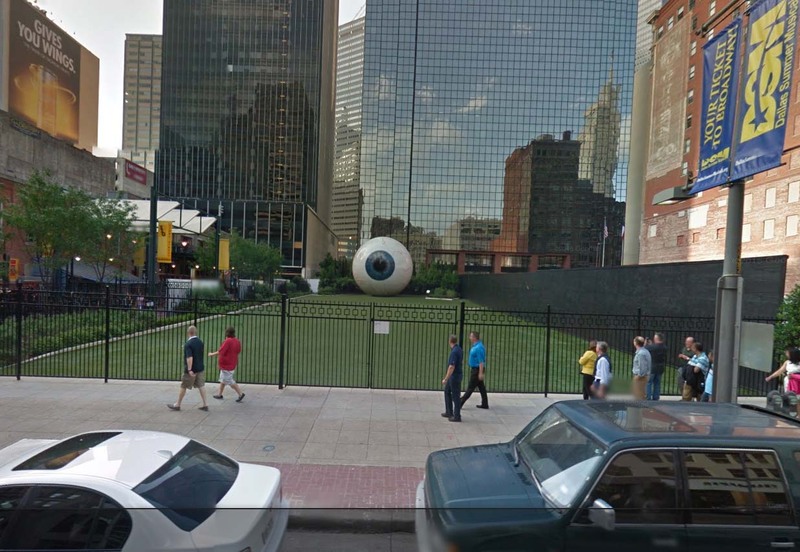 Unfortunately, the building was razed a few years ago, which is too often the outcome for many buildings I search for, but what replaced The Praetorian Building surprised me, and I’d like to think that the ghost of The Praetorian Building is still keeping an eye on things in Dallas. I would love to keep Google Tripping today, but more newspaper metadata awaits. Now it’s your turn. Armed with the information provided by the Texas Digital Newspaper Program you can now take your own Google Trip! Posted July 30th, 2015 by Ana & filed under General. The Texas Digital Newspaper Program is excited to announce the availability of The Dallas Voice, comprising over 79,000 pages, and representing the Dallas LGBT community since 1984. Many people have dedicated hard work to creating and digitally preserving the Dallas Voice, and we are very happy to celebrate its addition to TDNP. Many hands worked together to move this project forward. First of course are the men and women who wrote the newspaper, starting in 1984. The Dallas Voice began as a joint investment of $250 between three people: Don Ritz, Robert Moore, and William Marberry. At that time, Marberry served as the publisher, with Ritz standing in as editor and Moore as advertising director. From this small but dedicated group came a 24-page, first issue on May 11, 1984, with a headline of, “Dallas Gay Community Pulls Together for Election.” In a few short years, by 1988, the Dallas Voice became an important resource about significant issues of the day. The July 8, 1988, issue spotlighted the Dallas County AIDS Planning Commission report, with excerpts from the report, particularly focused on “Community resources, Education, Health care, Hospitals, Insurance, Legal/ethical issues, and Public information” (July 8, 1988, p. 4). True to its name, the newspaper became a steady voice for the LGBT community of Dallas. Astute political commentary, such as the “Gossip” column about “Don’t Ask, Don’t Tell” from July 30, 1993, plays a significant role in informing and representing an important community in Dallas, in Dallas County, and in Texas on national issues. In early 2012, Dreanna Belden and Ana Krahmer of the UNT Libraries reached out to Robert Moore to explore the possibility of digitally preserving his newspaper collection and donating the entire physical archive to the UNT Libraries’ Special Collections. Through this work, the UNT Libraries’ Special Collections, headed by Morgan Davis Gieringer, brought the physical newspapers to be added to UNT’s LGBT Collection, and the Digital Newspaper Unit added existing PDF editions of recent issues for digital preservation via the UNT Digital Library and The Portal to Texas History. The Dallas Voice Collection represents the first run of an LGBT newspaper to be made freely available and digitally preserved in the United States in its entirety. Digitization of this collection was made possible through support from a 2014-2015 TexTreasures grant: “Let It Be Heard!” through the Institute of Museum and Library Services and the Texas State Library and Archives Commission. In addition, funding has been provided by Robert Moore, former publisher and continuing friend of the Dallas Voice. This project represents a true and successful collaboration between many groups in the UNT Libraries, that we are all proud to have worked on.This important collection is a highlight among the many treasures in the UNT Libraries’ LGBT Archive. These materials are significant in documenting the history and culture of LGBT communities in the Dallas/Fort Worth area, and they will serve as a valuable resource for generations to come. Posted May 6th, 2015 by Ana & filed under General. This week, we have an invited guest blogger, Tim Gieringer. Here on the Digital Newspaper Team, Tim creates all the metadata for the newspapers we upload. He’s been doing a lot of research for this guest post, so I hope you enjoy! Thank you for inviting me to do this post! I’ve always had an interest in history, research, and architecture. Since moving to Denton, I have been involved in providing research for historical markers for the county’s Historic Iron Bridges project and researching dozens of homes for City of Denton Historic Landmark designation applications (including my own). 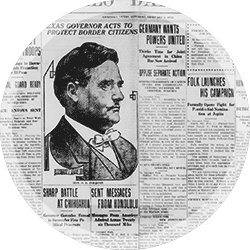 This research often involves using historic newspapers on The Portal to Texas History. Some of the more fascinating and popular items found in historic newspaper collections are the advertisements. Whether for unfamiliar products of the past or for early versions of products that remain household names today, the ads seem to still catch your eye. Of course, that’s what they were designed to do. I have long had an interest in historic homes, so my eyes are naturally drawn to advertisements for houses. 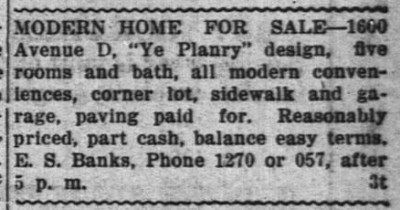 When looking through these old house advertisements, some of you may be surprised to learn that buying a house in the early part of the 20th-century often meant first picking up a newspaper. From there, you may have been swayed to send off for a mail-order house catalog or visit a local business to see their house plan catalogs and displays. Indeed, unless you were wealthy enough to hire an architect to design your home, chances are you were building your new home entirely through mail-order or hiring someone to build it based off a set of plans you had purchased. At one point in time, you could pick a house out of a catalog and literally have it shipped in its entirety to you with instructions on how to build it. By “entirety,” I mean from the wood, right down to the sinks and door hinges on the inside. The houses usually came by railroad and could be constructed by a contractor or sometimes even by a handy homeowner. Sears is by far the most famous company to widely offer these mail-order homes. (It’s a fun trivia fact that people like to throw around, and there are a lot of people devoted to identifying Sears homes.) 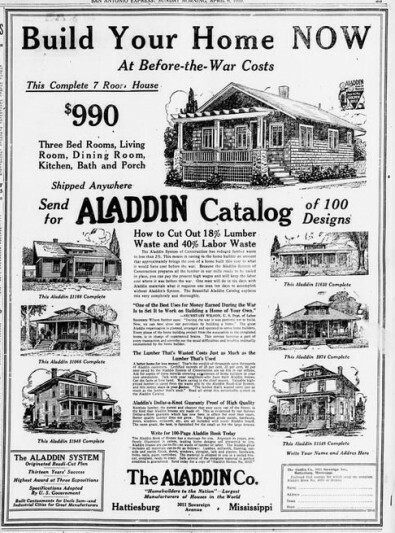 However, Sears had several competitors, one of the largest being a Michigan-based company called Aladdin. As you can see from this 1919 San Antonio Express Aladdin ad, two of their main selling points were the many designs available and monetary savings from cutting lumber and labor cost, with the idea being that the lumber came to you already cut to specifications and thus requiring less time to prepare. Another popular method for new home owners was picking out a house plan from a catalog and hiring a local company or contractor to build your home based on those plans. These plans could be ordered through the mail, or you could visit a local company, usually a lumber company, that would also sell you the materials and help you consult their catalogs and displays. As with mail-order homes, there were several companies of varying sizes offering plans. Perhaps the best-known of these plan book companies was Ye Planry which was founded in California but eventually moved to Dallas, and was a company known for its bungalow plans. This 1920 Brownwood Bulletin ad shows a typical ad from a lumber company. As I was putting images together for this article, I was surprised to find that there may have been some contempt between the mail-order and plan book home companies. 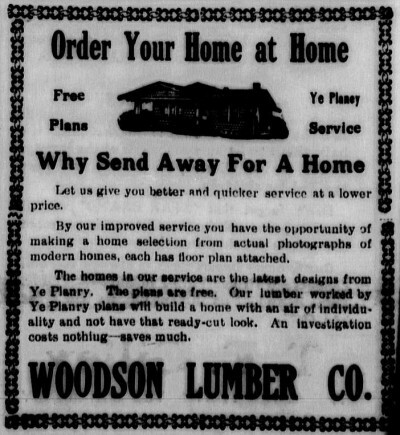 The 1919 ad from the Burleson County Ledger, the title image for this post, states, “Our lumber worked by Ye Planry plans will build a home with an air of individuality and not have that ready-cut look.” I am still watching my mailbox for a reply from the mail-order companies. This is just a quick look at a couple ways many of the older homes in our communities may have been built. I hope this encourages you to look closer next time you see an old home and try to figure out if it was mail-order, plan book based, or custom built. The fascinating thing about old homes is they all have a story to tell. There’s a chance that you might walk past a Ye Planry Home every day without even knowing it! For the next time Ana asks me to be a guest blogger, we’ll take some Google Map trips and tour the past as it exists in the present! It’s Time for Barbecue–and a Ball! Posted March 31st, 2015 by Ana & filed under General. Let’s throw a ball for Texas Independence Day, and let’s also do a barbecue, just like the citizens of Rusk County did in 1845, on the ninth anniversary of the celebration. Samuel Monroe Hyde gave the address, and he also gave permission for the address to be printed in The Texas National Register, where it arrived for publication a month after it had been spoken. Hyde proclaimed that the Texians of ’36, “a Milam, a Bowie, a Crocket, a Travis, and a Fannin” made Texas “free, sovereign, and independent.” Hyde served as an agent for another early Texas newspaper, The Red-Lander, published in San Augustine. The Red-Lander first began publication in 1838 as a Whig party vehicle, showcasing national and international gossip in its first few pages with local news appearing in the last 1-2 pages of the paper (See “San Augustine Red-Lander” at http://www.tshaonline.org/handbook/online/articles/ees24). Interestingly, the roots of later 19th-century Reconstruction and state politics dominated Whig Party ideology, which relates to why the Red-Lander newspaper covered so much “international” news of the day–with “international” referring to what was then the U.S. according to the Republic of Texas. The Whig Party itself divided over the issue of slavery and eventually died off, but its ideas remained influential in politics for another half century. Samuel Monroe Hyde was an early Dallas settler and among the first owners of what is now the northern side of White Rock Lake in Dallas, which adjoined land owned by his father, John H. Hyde. This land was parceled out to the Hydes in the 1840s by the Texas president Anson Jones, whom S. Monroe Hyde toasts in the independence day speech as, “An accomplished gentleman, an able politician and independent citizen; our foreign relations are safe in his hands, even at this present critical juncture.” In short, it’s time for some good barbecue and a nice ball. Just make sure to wear a napkin around your neck to keep your ball gowns and tuxes tidy!